I think its safe to say that you cant swing a dead cat in the feed without hitting a post that is saying they are hoarding something. Hoarding has become so much a part of the trade economy, that the app has even started providing reward cards for the users that can gather the most of a certain card. Here are some thoughts on the subject. The word hoarder never used to apply to the base cards the way they do now. In fact, closer to weeks 5 and 6 from launch, hoarding applied more towards certain users who had found ways to stock up on some of the most valuable cards in the game. These are the guys who had 10 Vintage Han cards, coupled with their 15 Widevision Obi Wans. That is just insane when you think about it, especially considering that these cards were at the peak of their value. Around that same time, there were users who had started enormous collections of white common base cards, and were showing them off on Twitter and other outlets. The concept of being the quintessential collector of a certain character’s card started to spread from that point. 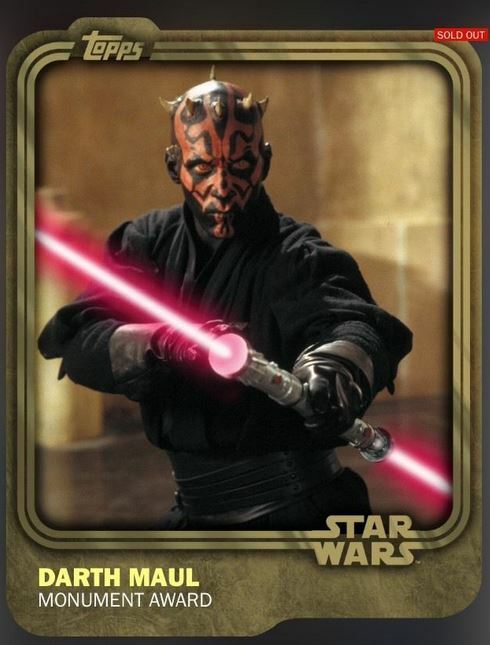 Eventually Topps rightfully wanted to reward the tedious work that these users had put in, and offered the first monument card – Darth Maul. The top 20 hoarders would get their time in the sun, and it would provide incentive to everyone who wanted to start their own collection. Let me start off by saying that I think hoarding is a good thing for SWCT. It provides a use for base cards that never existed before, and anytime base cards have added value, im all for it. Similarly, it adds a banner to the user’s profile, basically saying that as a user I am someone who identifies with X or Y. Because the faction affiliation really doesnt offer much, hoarding has taken its place. The best part of it is that there doesnt even have to be a monument in the works for people to want the card. People still hoard Darth Maul and the other monument cards just because they like the character. Its pretty impressive when you think about it. As I mentioned above, I think hoarding is a good thing. However, I wont take up your quest unless I know you personally. If I know you, take whatever base cards you want, as long as you dont mind your trade sitting for a while if I am offline. I dont have a hoarding collection, so it doesnt bother me if my friends take some of my goods. That being said, when I post on the feed, I dont like random people sending me hoard offers. Im fine accepting one or two trades, but any accepted trade signals to the user that the floodgates are open and that they shouldnt stop until its dry. That is just not cool. I am horribly OCD about pending trades in my inbox, and I really dont want to open the app to find 15 pending hoard offers from people I dont know. In that same vein, I would advise against sending blind hoard offers too. My suggestion is to send a note with your trade from the feed, just to see if there is something you and the person you are offering to can work something out. You might even want to ask how many of your hoard card they are willing to give up. Set expectations ahead of time. How Should Topps Support Hoarders? There are a lot of reasons why the monument cards got messed up, and it has caused some level of stress on the people who were owed those cards. More importantly, I believe there is a huge opportunity to take monuments a bit further. If I were Topps, I would be adding special awards for collecting a ton of any one card. It would be better if the award could come with its own mini monument, a card generated when a user completes a designated hoard. If that isnt possible, coins work too. I just think it would add a lot to the game’s economy if Topps made hoarding a regular part of the reward system. Similar to collecting a complete set of base cards, users should get monument awards when they hit 1000 of a group of designated monument base cards. You hoarded 1000 Han Solo base cards? An award is unlocked in your trophy case. You get a card to commemorate your achievement, and maybe a coin award. Same goes for Vader, and so on and so forth. Make it a thing. Do a new one every day or week. Every so often another monument style chase like we have had with the few already would come around, but it would add validity to all those other people who are brave enough to hoard cards like Jocasta Nu. I would suggest changes to the trade system to allow for more than 9 cards at a time, but I know that would be very difficult to do. Either way, hoarding looks to be here for the long run, so its time to start getting more involved. This entry was posted in Star Wars Tips and tagged Baseball Cards, Bunt, Football Cards, Huddle, Sports Cards, Star Wars, Star Wars Card Trader, topps, Topps Bunt, Topps Huddle, Topps Star Wars. Bookmark the permalink. i cannt understand the reason for keeping whites, once u ve already done all white awards. is there any reason? or this post refers only about inserts and highvalue cards?